Below is a short list of the facilities there will be at SHA2017. Highlights of this will be written in the Booklet. Team:Info will bug every team to write their stuff here. The terrain has permanent basic facilities: showers, toilets and power. Using a scale-up approach more facilities will become available as more angels and orga are on the terrain. It will start with the sanitary cabin next to the orga field. Basic power at 10+ locations - Only for devices not consuming too much power. Do switch when the power generators are on. Schuko is recommended, there are no 16A blue CEE sockets. If you arrive by car or motorcycle, you cannot drive it onto the terrain. There is a parking lot opposite of the terrain. The parking lot is closed for newly arriving cars from 00:00 to 6:00, please plan your trip so you arrive well before 00:00 or after 06:00. First Aid station and the Security tent on the main orga area. In case of an emergency please contact team Safety, call 2222 on your dect phone to contact our operator or talk to anyone with a handheld radio, state the nature of the emergency and tell us the exact location. No Open fire (charcoal bbq, campfires) allowed anywhere on the terrain. When using a boot the skipper is always responsible (please be careful) or ask the harbour authority for assistance or advice. All official lectures will be recorded and streamed live, unless stated otherwise. After SHA2017, the complete archive of these recordings will be published online at here. Tardis room: Somewhere on the field. Additionally, several villages have composed content schedules of their own. If your village is presenting lectures and/or workshops, and you want to add these to the listed programme, please contact the Speakerdesk via xxxx. and if we're not busy helping people, we are also nice to have a chat with. The SHA2017 event can't happen without volunteers, so the Volunteers team is there to make sure all visitors who want to volunteer can do so and get all the TLC they need. If you (maybe) want to volunteer register an account at https://volunteer.sha2017.org/ and once you arrive at the campsite walk over to the volunteer desk at the center of the camp to let us know you're here. There you will receive further instructions about how you can help. No strings attached, you decide how many shifts you want to do. If you do volunteer, however, expect a free and healthy meal, a lot of people who are happy to see you, and a warm and fuzzy feeling on the inside! To quench your thirst and hunger anytime, we have three bars and a food court to serve you. Badgebar - Badge hacking and drinks! Here we provide regular and special beer, wine, plenty of Club Mate and all kinds of soft drinks. There will also be hot beverages like coffee and tea to perk you up at breakfast or any other time. Need a snack? Salty and sweet bites will be there to sustain you and your SHA fellows. At the main bar, crisp toasties will be prepped on request. Due to local policy, alcoholic beverages will only be available from 2pm until 2am, and you need to be at least 18 years old to obtain these. In the food court, you will find many vendors who will offer a wide array of choice for breakfast, lunch, and dinner. Some products require a deposit. As efficient as hackers get, there are always some bits left over. Fortunately team:Waste has your back! We organize the trash-bins, empty them on a regular basis and get everything away from the field. about 100 bins scattered throughout SHA2017 to get rid of your 'regular household' trash. Drop trash in bins. Not around the field. Report (using the QR code on the front of the bin) the status of a bin. It's fun, helps us and creates cool stats! Take home what you bring to the field. Do not leave your tent, sofa's, projects etc. The distibution cabinets deployed on the fields can be used to power your stuff. Be kind and share your power with your neighbours. Keep things dry and use only outdoor extension cord in field, normaly marked with H07-RN-F, on longer cables or if you have heavy load, 2.5 mm2 cable is recommend. All power strips have been used in dry places only and above ground, that no water can reach them. 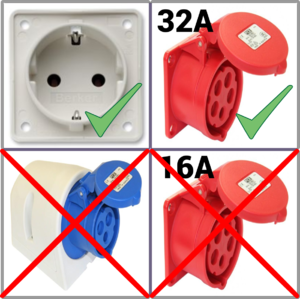 Use SCHUKO plugs only, we don't facilitate the BLUE 16A CEE plugs! There are some 400V/32A 5pol. sockets too for villages and bigger projects. Consult team power at power@lists.sha2017.org if you need to use one of those for big stuff like pizza ovens, you cannot use full power everywhere. Some Tips for Travellers, speciality from the US. Voltage is 230V 50 Hz, please check, that your device are ready for the higher voltage, most modern Laptop and phone chargers have a wide range power input, typically from 100-240 Volts. If you insert a 120 volt only device, it will be destroyed in seconds. If you have a 120 Volt only device, you need a voltage converter. 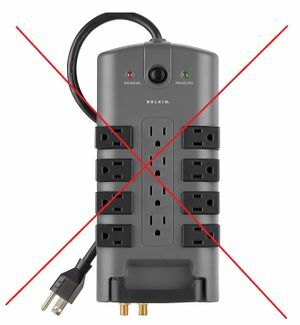 Do not bring 120 Volt surge protectors power strips (see picture above), they will trip a series of RCD switches and a lot of people will have a power outage. If we find them, we will cut them. 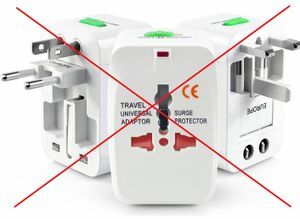 Use grounded travel adaptors only! Use them only in dry areas. 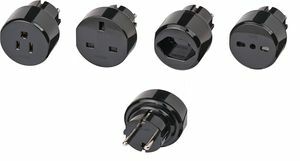 Avoid the fancy multi-country adapters, they are not grounded and bad in quality. If you have only one device, it may be better to buy a european power cord. There's an experimental 42V DC grid too! More info here! See Network for all information. Both wired and wireless network will be available. There will be a phone network available on-site. See Phone for more information. There are various supermarkets in the neighbourhood. Note that not all supermarkets are open on Sunday! Supermarkets are shown based on distance from the event. Forgot something for your camping needs? Van Duinkerken seems to be the closest shop to SHA2017 to fulfill your needs. There are various hardware stores in the neighbourhood. Stores are shown based on distance from the event. Be careful: what you buy you need to take home! We only have the waste infrastructure for regular 'household' trash! !